Alu řemenice s otvory (černě eloxovaná) pouze přední polovina pro alternátor a generátor Ø 105 mm. Nejen pro hezký vzhled v kombinaci s extra řemenicí HD konstrukce, která nahrazuje vnitřní polovinu, ale také otvory v řemenici, které lépe odvádí nahromaděné nečistoty např. z klínového řemene. 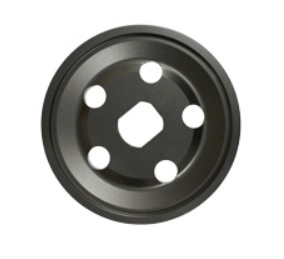 Pulley billet black anodized outer half only with alternator or Ø 105 mm generator. There are lots of Billet (aluminum) engine accessories to your motorcycle a well cared for look, we have some engine parts put together a list what you could possibly besides this pulley assembly. The use of aluminum is not only beautiful to look at but also persistent, if there is corrosion is a cloth with brass polish a perfect tool for the aluminum back shine. This alternator pulley replaces only the outer part (visible part) of the existing pulley and is provided with holes that are not only good looks but also ensure accumulated debris from the belt between the pulley halves late drains. You can use your existing rear pulley, but you buy the pulley probably just for looks, take it to a chrome pulley (see options) and you only used the inside.